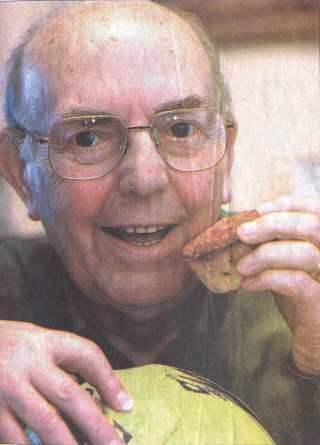 A Former pork pie maker will miss the chance to put his expert taste buds to the test at Calderdale's annual pork pie festival. Mr George Holt, of Elm Gardens, Halifax, who is also a former Halifax Town footballer is busy recovering from his second hip replace­ment. The festival will be held at the Old Bridge Inn, Ripponden, on Saturday, March 9. Mr Holt, who celebrates his 75th birthday today, said he had kept his recipe a secret and still makes pies at home for friends. "Your first bite into a pie is the real test. You have got to get the pastry right and if the crust is not nice the pie is not going to be." He said he would cele­brate his birthday by having a meal with his wife, Shirley, 60, and daughters Lisa Fisher, 28, and Louise Holt, 24. Mr Holt played for Halifax Town's first team between 1951 and 1954, at a time when the team regularly drew in crowds of around 35,000. He was first selected for the team in 1948 after scor­ing a hat-trick on his debut for the reserves but did not cement his place in the regu­lar first team until 1951. Mr Holt, who was on £5 a week plus a bonus of £2 for playing in the first team, said the salaries of today's footballers were astronomi­cal, including football man­ager Alex Ferguson's recent contract which puts him on £70,000 a week. Leeds fan Mr Holt, retired from professional football at the age of 27 and bought a butchers' business near Thrum Hall, Halifax, which he called George Holt Butchers. He took over a business in Southowram, Halifax, and later turned it into a pie business, George Holt Pies. A business partner, Mr Nigel Shepherd, later joined him and took over when Mr Holt retired the age of 62. The shop, which employed 32 members of staff and sold to cash-and-carry business­es, hospitals, market shops and individuals, closed about four years ago. Mr Holt recently attended a match at Bradford City's Valley Parade against Crystal Palace, where he was presented with a tankard - 50 years after he played at the ground for Halifax Town.